I’m now a senior in college—a fact that was confirmed tonight when my friends and I walked into a frat party and realized that we wanted to leave after just five minutes. We were waiting in some crowded little room, clutching our solo cups, hoping just to catch a glimpse of the keg (let alone an ounce of beer), when we decided that this wasn’t our idea of fun anymore. There we were, a group of 21 year old girls in jean shorts and flip flops, surrounded by the new freshman that were decked out in high heels and whorish smelling perfumes…one of these things just doesn’t belong here. So we headed to Brickell to mourn the end of our “fresh meat” status, over a round of Blue Moon beers at the Irish Pub. After attaining our much-needed buzz, we decided to move on to its late night counterpart—FOOD! When I go out with my girlfriends, I would say that we spend ½ the night talking about the drunk food we want to eat, and the other ½ of the night actually consuming that food. As you can imagine, there was a great deal of debate as to where our fourth meal would be enjoyed, but eventually we decided to make the trip to South Beach for La Sandwicherie—who can resist the “secret sauce”? If you haven’t tried this secret sauce that I speak of, well then you haven’t fully experienced life. The secret sauce is a flavorful, homemade, Dijon mustard kind of dressing that can make anything taste incredible, especially theProscuitto Mozzarella Sandwich that has made La Sandwicherie so famous here in South Florida. The sandwich comes with thinly sliced proscuitto, fresh sliced tomato, red onion slivers, lettuce, and creamy mozzarella all on a French baguette. The flavors and textures balance each other perfectly; the proscuitto adds the perfect amount of saltiness to the mozzarella, the lettuce and red onion are crisp against the soft roll, and the secret sauce adds just the right amount of tang to this enormous sandwich. I must confess that my roommates and I seriously debated the proper term to describe this inexplicably delicious sauce as we inhaled our sandwiches in my car, and tang was the best that we could come up with. I’m not sure if it’s the best adjective, but words cannot possibly capture the amazing-ness of this stuff anyways. Ohh, and the best part about La Sandwhicherie is that it is guilt free drunk food, unlike Taco Bell or pizza. I mean, no one likes to wake up in the morning and find Taco Bell hot sauce packets scattered around their car (we’ve all been there), but to wake up and find a little container of secret sauce in your console…well, that is like finding a precious gem. Although I go to La Sandwicherie for late night dining usually, it is equally as delicious mid-day sober too. 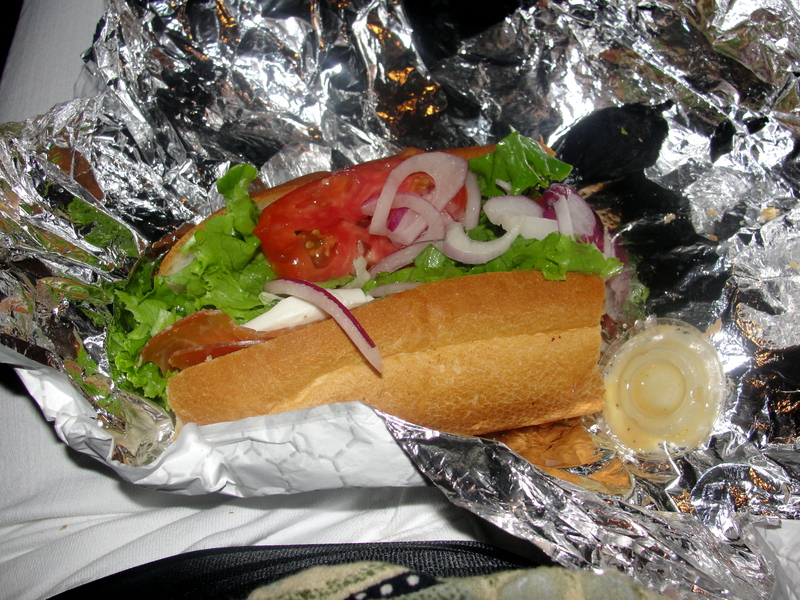 Please, please, please, go to La Sandwicherie…but caution: it may be habit forming!